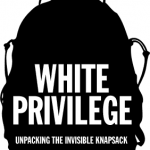 Peggy MacIntosh’s 1989 reflection White Privilege: UnPacking the Invisible Backpack on her own ‘white privilege’ has been a go-to training tool for over 25 years. The piece effectively points to everyday experiences of racial exclusion: “I can choose blemish cover or bandages in “flesh” color and have them more or less match my skin” while also raising systemic issues: “I can be pretty sure that if I ask to talk to ‘the person in charge,’ I will be facing a person of my race.” The fact that this short piece has had such enduring success is both worrisome and encouraging. I finding it chilling to note that each of MacIntosh’s 26 reflections appears as relevant today as it did in the late 80s. That said, I also find that in most training sessions that I run there is someone present with a familiarity of the concept of ‘privilege’ and a willingness to openly acknowledge her/his own reflections about how she/he may benefit from systems of oppressions. This awareness, is in no small part, attributable to MacIntosh’s work. It is interesting that while MacIntosh’s piece has been used most broadly as a self-reflection exercise for those who experience racial privilege to become self-aware of this privilege, in the same piece MacIntosh questions the usefulness of the term ‘privilege’ since she is more concerned with structures than with individuals and acknowledges that being a member of a ‘privileged’ group does not guarantee being ‘privileged’ in the sense of being favoured or rich. 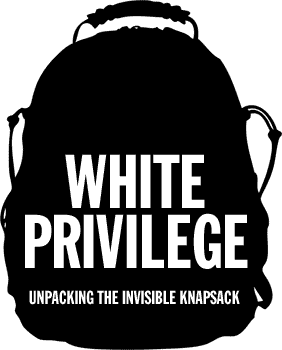 Accordingly, I think it is helpful to reflect on the concept of ‘privilege’ and how it can be used both effectively and ineffectively in training. The term ‘privilege’ has been used to refer to “a set of unearned benefits that some individuals enjoy (and others are denied) in their everyday lives, by virtue of their place in a racial or gender or other ‘identity’-hierarchy” (PublicAutonomy.org). In any systemic ‘privilege’ there are both winners and losers; whatever advantage is making the world more comfortable for me, is making it less comfortable for someone else. Working from within Women’s Studies, MacIntosh observed that even when members of a ‘privileged’ group acknowledge that others have it bad, it is hard for them to recognize the ways that they have it good. ‘Privilege’ in this sense does not refer to how nice your car is or isn’t, or even whether or not you have a car or a home, it refers to your position in relation to an existing system of inequity: male/female, gay/straight, racialized/non-racialized. The practice of making people reflect on their ‘privilege’ has been criticized on a number of fronts. For those folks labeled as ‘privileged’ these discussions may foster guilt and/or resistance. If privilege is reduced to individual experience it may be hard for folks who have dealt with multiple struggles in their own lives to perceive themselves as ‘privileged’. Their resistance to seeing themselves as ‘privileged’ may also create a resistance to recognizing structural inequities. In these discussions the opposite outcome of what is being sought is produced: by using a personalized entry point to understand broader structures, the facilitator may unintentionally foster greater resistance amongst those labelled as ‘privileged’ to seeing these broader structures. Some anti-racist practitioners have also faulted the ‘privilege’ based approach for shifting the focus in conversations of inequity to those in already privileged positions. Andrea Smith (2013) describes the practice of confessing privileges in workshops and at conferences as an “ephemeral” exercise which treats self-reflection as a political project in itself, rather than a step towards collective efforts to address inequities. The mistake here is assuming that by publicly sharing that “Hi, my name is Nicole and I have the following privileges” I have also committed to joining efforts to address this privilege and to listening to those who don’t have these privileges. Discussing ‘privilege’ effectively requires that trainers/facilitators not treat it as a confessional exercise intended to arouse guilt, but as one possible entry point to seeing hidden structures of inequity. It is also important that these discussions acknowledge multiple exclusions and recognize that while you may benefit based on one aspect of your identity this does not mean that you are privileged in all areas of your life. This can be used as the basis for forming coalitions between groups who face different challenges but can support one another in the collective struggle to address inequity.